I LOVE decorating my mantel seasonally. I did it before I blogged, I do it a little more intense now, and I will continue do it even if I stop blogging one day. It is just me. I love adding touches of seasonally décor throughout my home – my table, coffee table, towels in the kitchen/bath, wreaths, and on the mantel. So today’s mantel is a simple but pretty mantel that could completely work all year in your home. I will call this style traditional with a touch of glam. I am showing the hearth decorated too but that is completely optional. I use the bench since I haven’t found a nice big chair to put by that window/corner so it add some coziness with a pillow and throw tossed on it. 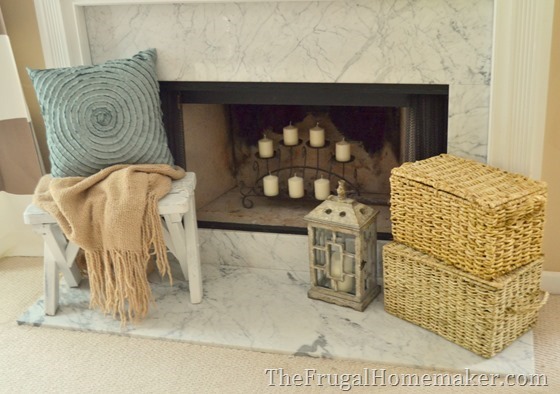 But I definitely think some baskets on one side of the hearth (that can be used for storage of toys, books, magazines, or wood if you burn wood in your fireplace) and maybe some tall candlesticks or a houseplant on the other side can look very nice. For the décor on the mantel I stuck with some basic accessories – much of which I have found at yard sales/thrift stores. 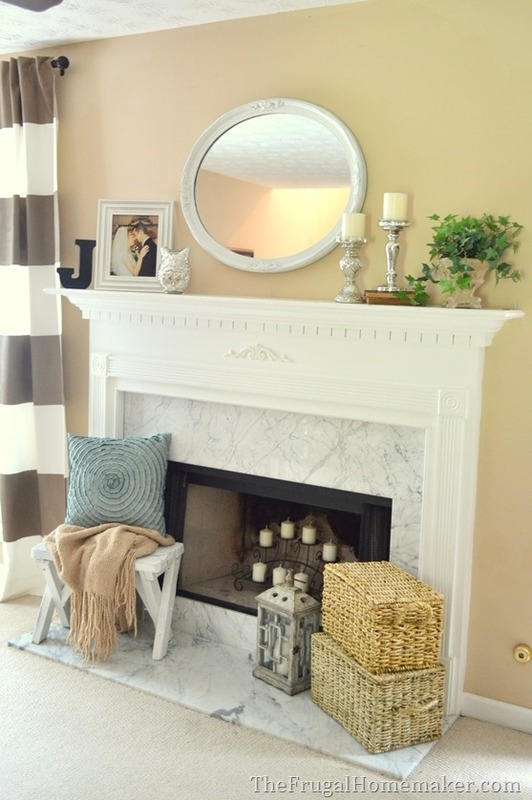 I centered a nice white oval mirror over the mantel. A very traditional/yet pretty way to accessorize a mantel. Look at thrift stores/yard sales for mirrors – this one was $8 from a bargain sale/consignment sale and I spray painted it white. I added some personal touches on the left with the letter J for our family name and a wedding photo and a mercury glass owl. I love owls and love mercury glass so this is one way I can decorate with accessories that are not only pretty but meaningful/personal to ME. 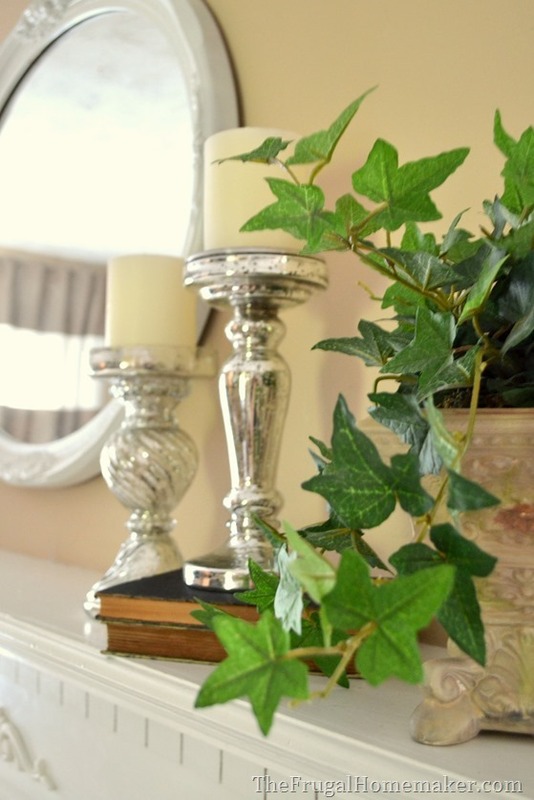 I echoed the glamorous look of the mercury glass on the opposite side with some candlesticks – another mantel decorating basic. Since the candlesticks are the same height, I put one on top of a stack of books that also help add some texture. And then added a small pot of faux greenery for some color and more texture. 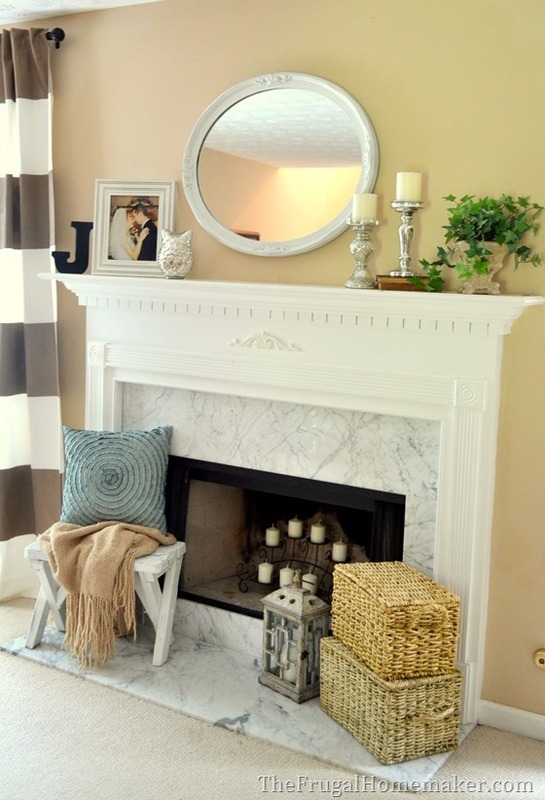 So there is a simple, pretty mantel that I know I would enjoy in my home! What about you? 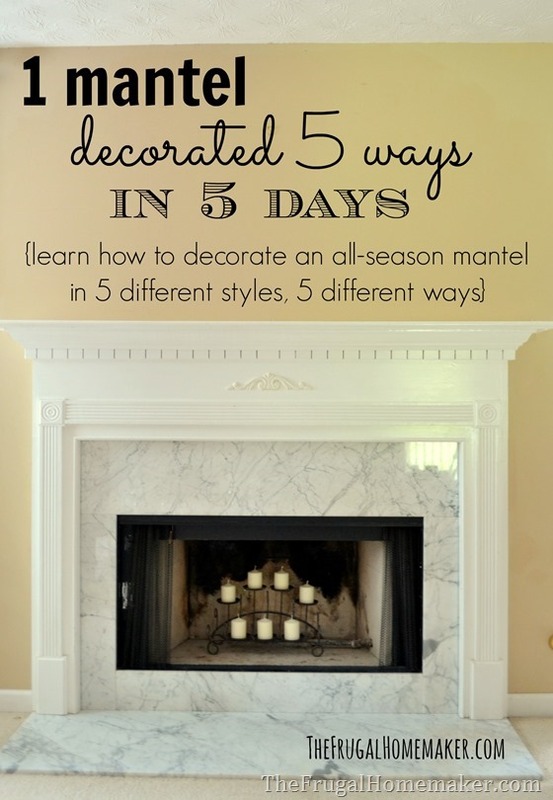 Come back tomorrow to see another mantel decorating idea. And if you have a particular style (country, rustic, modern, eclectic, etc.) that you would like me to try to address leave that suggestion in the comments. Ooohhh, I love this series idea! And I love your mantel too! Especially love the white bench with the throw & pillow on top to soften things up. Can’t wait for the rest of the posts! 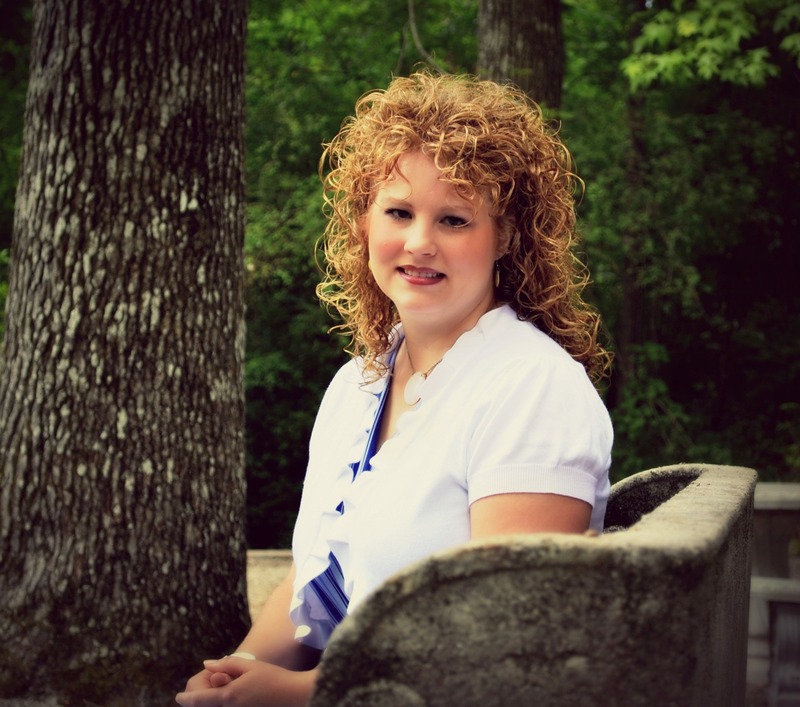 I love your site!I would like to see you show a “fall”mantel as well as one for around christmas as well! thanks!! 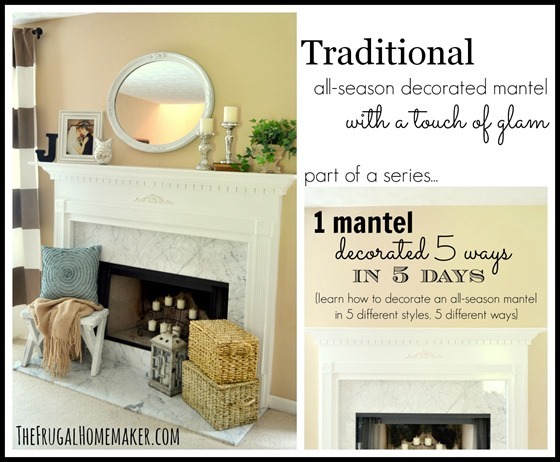 So glad you are doing this mantel series – what a great idea! I love your other mantel decorating posts and can’t wait to see your ideas. I do pretty well with decorating for the different seasons, but need more ideas for the everyday…..I’d like to see what you come up with for rustic and eclectic! Looking forward to the rest of the week….. This is going to be a popular series I think – what a great way to showcase all your thrifty finds!! Cheryl @ The Creative Me and My McG recently posted..Thrifty Finds in Muskoka! 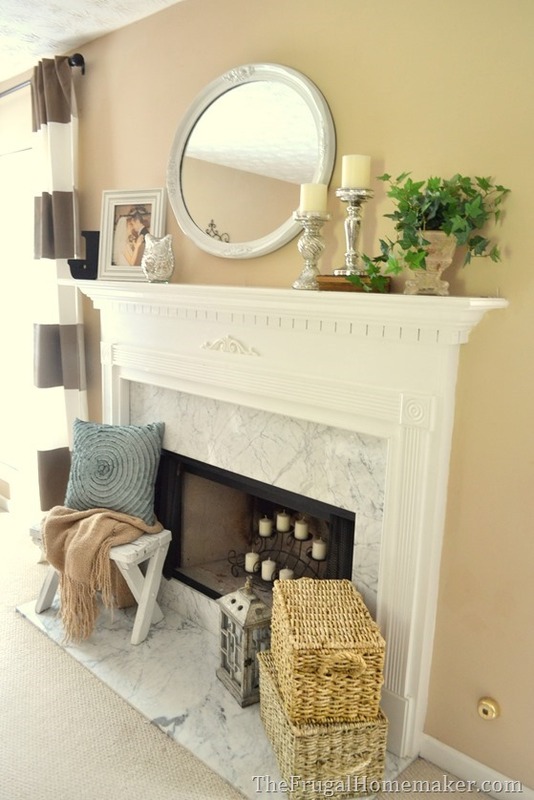 I’d love to see an eclectic vintage mantel… Using a mantel to maybe showcase a couple of those special vintage finds! I just love how you decorate with all the things you find. You know how to pull everything together and it looks awesome. Love your blog. Hi Christine! I love this traditional look. It’s pretty much my taste, I’m not too adventurous when it comes to decorating. I like the “year round” approach, particularly since I’m not always up to speed changing decorations out with the seasons. For instance, today I decided to finally hang the lace under-curtains in my bedroom, and the end of summer is nearly here. Sigh. Well, I will switch things out in November. I am not one to rush my seasons, no sirree. LOL! I do have a question — why did you hang the mirror in what seems to be a bit lower than usual spot? 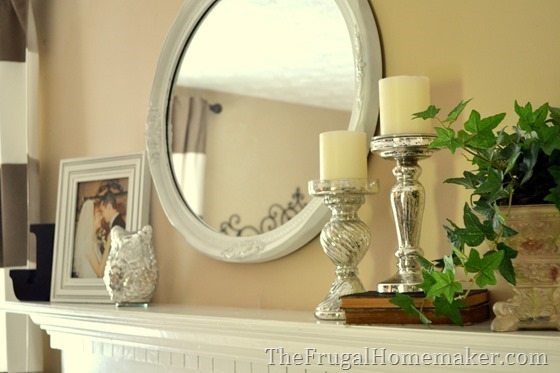 Shouldn’t there be more space between the bottom of the mirror and your mantel? Curious as to why you decided to hang it where you did. Thanks so much for doing this series, you’ve given me a lot of good inspiration (as per usual). I hung a piece of Charleston iron gate over my mantel, but not sure how to finish the look with accessories on the mantel. Any ideas? Maybe candlesticks on one side and a small floral or greenery plant on the other side? Or a framed family picture on one side? I love this look. It’s basic and pretty. You can personalize with the pic. Hi love your ideas and the fact that they are low cost is fabulous. I have a southwestern Kiva fireplace with high ceilings. Do you have any suggestion on what to display?